The Sutherland Self Help Trust owes its existence to the foresight and social awareness of the late Arthur Sutherland. Arthur began working with his father, Ben, in the first Self Help Co-op grocery store after school and on Saturday mornings. Working towards his accountancy examination on the side, Arthur learned quickly. He had successfully introduced the Self Help Co-op into the Auckland and Otago regions by the time he was 21 years old and became Managing Director a year later. Long before the Welfare State became a reality in New Zealand, Arthur Sutherland had pioneered innovative staff relations within Self Help. Arthur Sutherland set up a staff benefit fund which financed 90 percent sick pay, 100 percent medical benefits, a baby bonus and a marriage benefit for women staff members. He also planned the staff superannuation scheme which, at the time, was a most unusual feature for a private company. It was his idea that the Sutherland Self Help Trust should be developed. He proposed the idea at a fireside gathering of the family in 1941, and the next day made the first contribution of a property worth $10,000. The year after the founding of the Trust, Arthur Sutherland died. The Sutherland Self Help Trust is his memorial. In 1922, after 32 years of service with New Zealand Railways, Ben Sutherland was on the verge of a safe, comfortable retirement. He was then in his 50th year, at an age when most men look to the past, not to their future. Ben Sutherland, however, had an idea. He knew that a high proportion of hard-earned wages went into groceries. So he decided to fund a Railway Co-op with the shareholding open to all members of the railways. His age and training weighed against his success. His friends attempted to dissuade him from the venture and there was no practical support forthcoming in the form of shareholders. Alone and unaided, Ben Sutherland carried on. He knew his basic idea was sound. Instead of making the highest possible profit on the goods he sold, he would reverse all normal trading methods and sell for the lowest possible profit. He would give the greatest number of people the highest quality goods at the lowest possible prices. On October 27th, 1922, he resigned from New Zealand Railways to begin his business career in a small grocery shop – an old building which once housed offices – opposite the Wellington Railway Station. Without capital, without experience, but with an instinctive knowledge of human desires and needs and a policy of stark business honesty, Ben Sutherland had started the Self Help Co-op. Ben Sutherland may have started unaided, but as a result of his pioneering ideas about improving staff conditions, increasing interest and incentive, and rewarding co-operation with increased bonuses, he quickly gathered around him an alert, enthusiastic and willing staff. His son, Arthur, worked closely at his side and was instrumental in expanding the Co-op, as well as furthering his father’s vision of staff and community welfare. John, the younger son, did not take a prominent part in the business. He enlisted for Overseas Service on turning twenty-one years of age, and served with the Royal Navy. 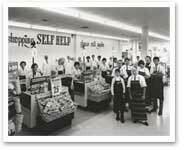 The Self Help Co-op was established in the grocery trade primarily to benefit the community. Instead of making the highest possible profit on goods sold, the Self Help Co-op rejected normal trading methods and sold goods for the lowest possible profit. This meant the public could purchase higher-quality groceries at lower prices, stretching their hard-earned wages further and benefiting their families. Success was not always assured, nor did it come without trials and struggles. Co-op methods were quickly accepted by the people who readily provided their own wrapping paper and string which low-margin profit did not allow in those early days. But powerful interests, who could not, or would not, see that the Self Help Co-op way was the economic way, often bitterly opposed it. 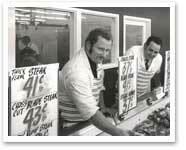 Self Help fought for its principles, constantly repaying public patronage with lower prices. So it grew – to 18 shops in 1926, 56 in 1929, 130 in 1932 and in 1942, nearly 200 shops. The Self-Help Co-op was also successful in pioneering staff benefits. Long before the Wage’s Tax and years before Social Security, the Staff Benefit Fund was introduced. Contributions of 1.25% on wages secured up to 90% sick pay, 100% medical expenses, $5 baby bonus, and $100 death benefit. Besides a quarterly bonus, $5000 was distributed to the staff annually in bonus payments. A Trust Fund for members of the staff serving in the Forces overseas was also established – a fund which was administered by the staff itself. All in all, Self Help made a contribution to the co-operative idea which is almost unique. With price fixing being more widely adopted by manufacturers in the 1930s, Self Help found it was not possible to sell some products at lower prices through its organisation. This is meant having to deviate from the policy of “lowest possible profit,” and the Sutherland family decided the extra return must go back to the people. To make this decision a reality, Arthur Sutherland conceived of the Sutherland Self Help Trust. Before the Trust was completed, Ben Sutherland personally investigated the operations of similar Trusts in the U.S.A and Canada. The inauguration of the Sutherland Self Help Trust was a culmination of the Self Help Co-op’s policy of furthering community welfare.